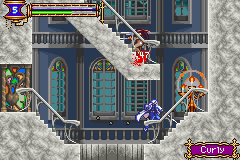 GBA Castlevania: Aria of Sorrow (USA) "warp glitch" in 05:07.56 by klmz. The Castlevania: Aria of Sorrow main quest TAS has become even more glitched. Using an obscure out-of-room travel technique involving in-game saving and subsequent dying, klmz plows through the game with the confident pace of a cold-blooded killing machine in a little under seven minutes — a whole minute and 8.13 seconds faster than the previous movie by the same author! We recommend reading the author's comments for more information on the death warp glitch and other time-saving techniques used to make this improvement happen. If you would like to see more of the game, we also have a run that does not make use of major warp glitches, as well as a run that collects every soul in the game.